Yesterday after the Halloween “trick or treats” and after my scheduled daily calls from work at night as I sit down to read a few lines… Our younger one who was still awake (courtesy to his afternoon Nap) asks me “can you read me a big book” Thinking he should be referring to the size of the book I tell him “yes go get the Big dog book”. Getting the dog books from library is his way of reacting to me for not fulfilling his ask for a puppy, if not puppy books he will like you to watch Clifford with him…. He looks at me when he hears the “big dog book” and says “not that book…. the one you read… the real big books….” He points to the fifty page worn out Pablo Neruda’s “Still Another Day” that I had in my hand…. I will share a ew lines from what I read him…. Again next time I need to be more prepared when he asks… because not all I read is that I can read to him…. 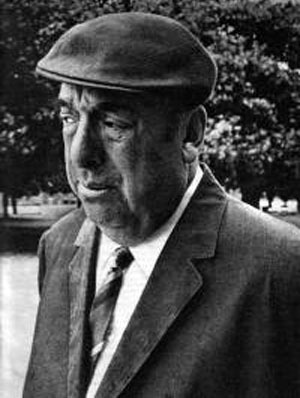 🙂 but a liking to Neruda will always make him a better person…. from the horses sweating in the rain….